With Forge World releasing their new "Zone Mortalis" rules, I cannot tell you how excited I am. I've played games before using makeshift rules to best represent the tight confines of Space Hulk style fighting in the game of 40k and it was an absolute blast. Perhaps one of the best games I've ever played. I guess it doesn't hurt that I love playing Space Hulk either. That's got to be my most favorite game on the planet ever. Bringing that and 40k together is nothing but a win for this little hobbyist. I've already downloaded my copy of the rules from the FW site and I'm excited to give them a go once I get an army together. I hope it's every bit as brutal as they make it out to be in their promo blurb. They mention the boarding assault rules previously published in Imperial Armour Volume 9: The Badab War Part One, but I haven't gone over those yet. I've glanced through the book looking at the pretty pictures, but skipped the rules. Looks like I'll have to give those a go as well. And the pics up there, those are from our game way back when. We played a surface game where I had to assault a bunker. Once I managed to get to it, I had to go down into it to remove the remaining resistance forces inside. I think I managed a win, but it was a costly one to say the least. I sent twenty plus guys in and only three survived in the end. I still love the original Space Hulk floors. So dark and grimy. They really suggest aged low-tech and gloomy lost spaces. With these rules out through an official channel, I'm thinking now what kinds of gameplay haven't been covered officially yet, or what new and unusual areas we can delve into with homebrew. Yeah i already know of three people with space hulk sets who are getting ready to try this out. 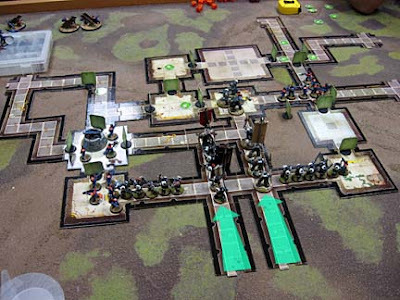 I've played a game of 40k using the Space Hulk tiles and the boarding assault rules from the Badab War book. It was brutal, I lost very quickly. I havent stoped seeing the video, and Space Hulk came to my mind the second they showed the pieces, it can be a little bit expensive for a 4*4 table but for a 2*2 is not that hard to justify. the blast doors are going to take a little way but the ones shown on the video look promising. I'm seriously considering to get at least the 2*2 pack. I enjoyed the rules for shooting in a vacuum which makes terminators particularly effective. Im defintely looking forward to playing a game of this in the future! Porky: Suitable for the game weren't they. Not the pretty stuff we have today. Tyler M.: Now we're talking. Brutal. Werner: I'm sure there are other ways to create the boards... even using Space Hulk pieces as needed would do. You could color copy them and enlarge them slightly to fit 40mm based models. Colonel Winterborne: I'd be interested in hearing how you got on with it and what you think about the new rules once you give them a go. The rules do indeed look like great fun, very reminiscent of both Killzone and old Space Crusade rules (blips). Not too sure about the terrain they're also releasing, seems mighty expensive for such a niche game/ruleset. I'm pretty certain nearly any level of hobbyist out there can make cool 1x1"-sized tiles with great detail at only a fraction of the cost. Hephesto: I agree, there have got to be lots of ways to make cheaper and just as effective boards for the game. I dug up my copy of IA9 to have a look through the boarding rules. The Zone Mortalis stuff is indeed very cool; I'm going to be very tempted to work up some scenarios for using my ever-growing Death Guard horde in a Space Hulk-type setting. This is a painful reminder that I have a whole load of sci-fi themed molds sat on an shelf at home waiting for me to make a 3D Hulk board with. 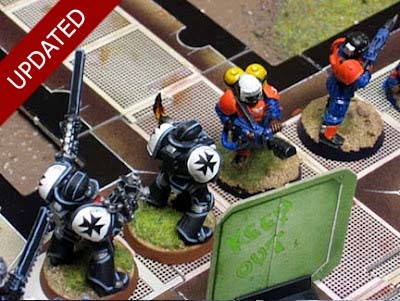 Have you seen the Hirst Arts plaster molds to make space hulk layout tiles? Sendraks: Good luck! I' going to stick to the flat tiles for now. I need to get an army together first. knit-fink: I have not. I've seen some (and used) of their smaller bricks and such for basing though. Hephesto: Thanks for the link! http://www.worldworksgames.com/store/index.php is a fantastic site for card-stock scenery. Just print some floors, stick them to cardboard or foamcore, and you are good to go! Leonard: They do look like they have some nice stuff on there. Thanks for the link.